Musicals - History and criticism - Juvenile literature. Musicals - Juvenile - Production and direction - Juvenile literature. Musicals - Production and direction. Gotta dance! Gotta sing! Gotta do most anything because it's show time! In Show Time! kids will learn to become "triple threat" performers, developing their skills as singers, dancers, and actors through more than 80 activities that include imitating a musician or musical instrument, acting out a song, creating a mirror dance, making puppets and playbills, and more. Along the way, they'll learn about the history of musicals, discover musicals about history, and find out how to get it all together before the curtain goes up. Show Time! 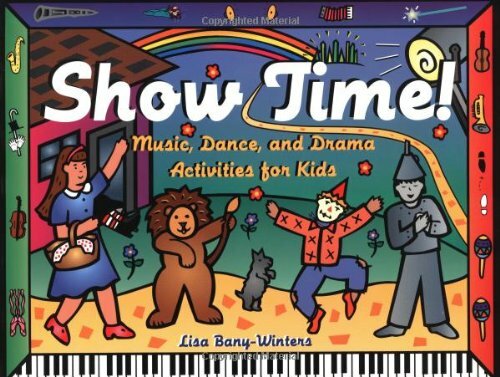 is perfect for teachers needing to prepare performers for a show; for parents looking for fun ways to fill spare minutes with their kids at home, in the car, or in a doctor's waiting room; and for kids wanting ways to enjoy themselves on their own or in a small group. Several play scripts, a list of suggested musicals for kids, and a play glossary are included.